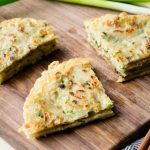 You can have these quick and easy Chinese Scallion Pancakes cooking on the stove top within five minutes. Inspired by the method to make Western-style pancakes, I've adapted it to make Chinese savoury pancakes. The only tools required for these quick scallion pancakes is just one bowl and one skillet. In a large bowl, mix together the flour, water, sesame oil and salt using a whisk until smooth. Set aside. In the meantime, wash and finely chop the scallions, discarding the roots and the tips of the green tops. Using your fingers, quickly break apart the chopped scallions to separate out the layers. Mix into the batter. Heat about 2 teaspoons of oil in large frying pan (I use one that is 10-inch / 25-cm) on medium-high heat. When the pan is hot, swirl the oil around so it coats the pan. Quickly ladle on the batter in the shape of a ring, then immediately use a spatula to spread the batter to fill the ring, and to spread the batter outward to make the pancake into a circle (I use about 3/4 cup of batter for each pancake on a 10-inch pan). The batter will cook quickly on the hot pan, so just spread it around as much as you can. Cook the pancake for about 4 minutes, periodically lifting the pancake up to check if the bottom has browned. When the scallion pancake has browned on the bottom, lift the pancake up with a spatula, quickly add a bit more oil to the pan, and flip the pancake. Cook for another 4-5 minutes until the bottom is browned. Remove from heat and set on a oil absorbing paper (or paper towel) to remove the excess oil. Repeat with the remaining batter. Using 2 frying pans simultaneously will speed up the cooking process. Get this recipe for Quick Chinese Scallion Pancakes (Vegan) at https://www.theworktop.com/breakfast-brunch-recipes/savory/chinese-scallion-pancakes/.